The most interesting part of the “Brainless In Seattle” two-parter might be the fact that it’s a two-parter at all. It’s a break from the show’s typical form, which prioritizes one case a week with its serialized story elements woven into that case. 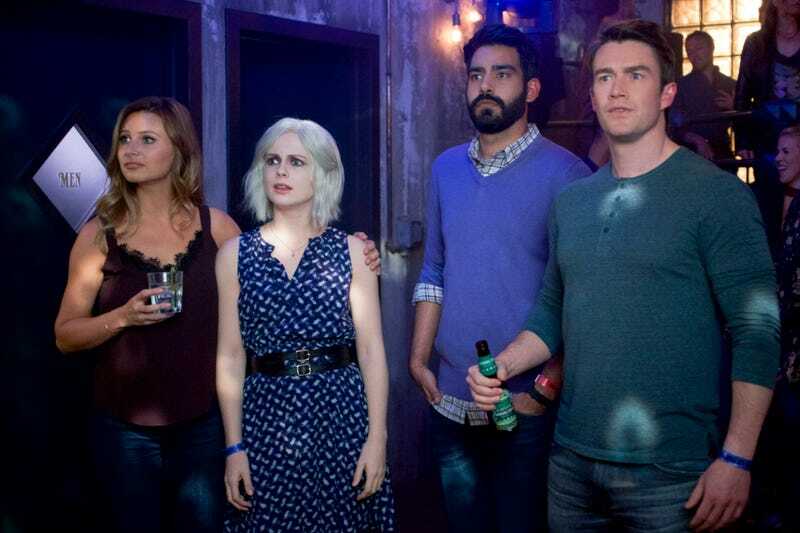 Typically iZombie only breaks that format at the end of its seasons, when the serial storytelling elements are simply too great to also support detailed cases of the week within an episode. Here, we have a fully contained case, told over two episodes, with the connected serialized elements also coming together to make one fairly well-constructed whole. It’s a break from format that pays off. That being said, if this episode needed two parts it certainly wasn’t to tell the murder story, the resolution of which ended up being shaky at best. The machinations in the first part were fairly standard, but the entirety of the “investigation” in this episode consists of Liv and Clive sitting in cars, and Ravi essentially taking over the case and trapping the killer via roleplaying as a posh British man who needs coyote services to get back to England. As amusing as Ravi is in these scenes—and hearing an increasingly panicked Ravi use the code word “pickles” is very amusing—it doesn’t really make up for the lameness of that final confrontation in the creepy murder basement. Also, Clive basically solved the case by letting Ravi do all the work and then just calling in SWAT at the end. Easy week for Clive! What the two-parter does give the writers, though, is the room to really dig into the side stories. A big part of these episodes was about advancing the New Seattle plots, particularly that of the city’s many thriving black markets and how that intersects with Fillmore Graves. From Blaine’s multi-business criminal enterprise that relies on trafficked brains, to the corrupt Fillmore Graves employee who runs a smuggled brain tube business on the side, to the benevolent coyote Renegade who only wants to help desperate people survive this new reality, to the increasing influence of Angus’ church, there was a lot of world building happening. And wow, is this new world dark. In particular, this episode advanced two of these stories by telling very specific stories about the new characters that populate them. The first is Renegade a.k.a. Mama Leone, who we learn was turned far before the immunization debacle. In fact, from her story it seems likely that Blaine turned her and then made himself her brain supplier. When she tried to warn the police about the homeless kids being murdered (which she saw via visions of the brains Blaine sold her), our old friend Lieutenant Suzuki covered up her concerns, and then her husband was killed as a warning. Tying her story to one we are familiar with makes her already sympathetic performance even more so, especially now that Blaine is on her tail. Taking the time to round out her character and make her a person rather than someone we are simply expected to care about because Liv cares is a smart choice. Now that she’s in Fillmore Graves’ hands, her connection to Liv—and Major’s connection to everything—becomes crucial. The other big development in this episode is the reappearance of Tucker the anti-zombie protester who was scratched and turned a few weeks ago. We really get a full introduction to him, from his friends basically telling him to kill himself to him finding his salvation at Angus’ church. Angus, now going by Brother Love to his followers, is the perfect place for a conflicted Tucker to land; they both hate Fillmore Graves far more than anything else, and the church gives Tucker a purpose as a zombie that he needed. The clever part is how this is all a way to bring Fillmore Graves—and more specifically Major—into contact with what Angus is doing, and what that means for them. This is an interesting season in that there is no clear antagonist as of yet, and everything exists in this weird evolving place where everyone thinks they’re doing their best. But as everyone carves out their places, the one person who keeps getting singled out is Major. Major, who thinks he’s doing the right thing by helping Fillmore Graves keep a civilized zombie population. Major, who Angus points out used to be the one freeing zombies, and now he’s policing them. Major, who went from an obsessive quest in season one to find the zombie murderer of his at-risk teens, to working for the operation who is now essentially starving those same teens because there aren’t enough brains. Everything keeps circling back to Major and his morality in this new world, and I’m not sure what it means yet but it’s one of the more compelling questions the show is asking in these four episodes so far. Whether that’s building to something for him personally or for Fillmore Graves and New Seattle as a whole is yet to be seen. As for Liv’s brain and the rom-com trappings of these two episodes because of that brain, it is one of the more satisfying brains the show has had in quite a while. Most of this is due to Rose McIver’s very game performance (and the rest of the cast’s hilarious reactions), but the show’s willingness to go all-in on the contemplative voice-overs, cheesy music cues, and spinning romantic kisses is what makes the whole thing come together. It also wraps up in the most satisfying way, when Liv realizes that her “lobster” Tim is just some pretty guy she barely knows who turns out to be a zombie supremacist and that her true soulmates are the friends who stick by her no matter what. That’s a soulmates story I can get behind. The one thing that didn’t work for me throughout these two episodes was how horrible Liv treated Clive regarding the Dale situation. He at least got the chance to firmly tell her that she’s out of line here, but it still feels like Liv gets away with being pretty awful to people on a regular basis. It’s not my favorite part about the brain-influenced personality conceit. Also, I was right that Clive and Dale are doing the open relationship thing. Hooray for spotting the obvious! Major on wrestler blue brain is THE BEST. We need far more wacky Major brain personalities, because between this and teen girl brain we know Robert Buckley can bring the goods. “You don’t even know his last name, look. You wrote ‘Mrs. Tim’s Wife.’” I really loved this brain.